Despite the very welcome news that mortality due to malaria infection had declined dramatically in the past 15 years (by an estimated 57% in sub-Saharan Africa), there is growing concern that this success is not sustainable and, indeed, may be reversed in the future. Interruption of malaria transmission by the widespread use of insecticide treated bednets, improved diagnosis and availability of effective drug treatment have been the mainstay of this improvement in the health prospects of those living in endemic areas. However, the first and last of these measures are under threat due to insecticide and drug resistance respectively. Unsurprisingly, we are witnessing a Red Queen scenario with the selective pressure we are imposing upon the parasite and its vectors causing resistance to spread rapidly. Both malariologists and vector biologists need to run faster to maintain our advantage. Vector biologists have been doing just that. Mosquitoes genetically modified to resist malaria infection, produce non-viable offspring or have a shorter life span are some of the alternative strategies to insecticides now being developed and evaluated. A group of colleagues led by Flaminia Catteruccia have taken a different approach to mosquito control. It is based on the disruption of hormonal control of mosquito reproduction, with the aim of reducing population size. The ecdysteroids are steroids that are synthesised by insects and other arthropods from cholesterol. They are best known for their role in the control of moulting and metamorphosis in insects. Henry Hagedorn and colleagues discovered the role that 20-hydroxyecdysone (20E) plays in the control of egg development in the yellow fever mosquito Aedes aegypti. This hormone plays a similar role in Anopheles gambiae, a major malaria vector in sub-Saharan Africa. Females synthesise it in their ovaries and, in addition, it is made by males and transferred to females during mating when in induces an increase in egg production and egg laying and inhibits receptivity to further mating. 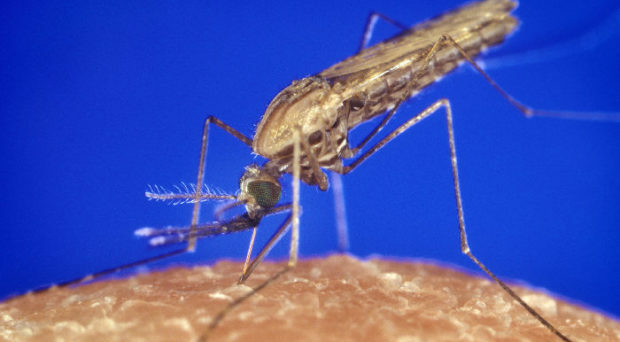 The Catteruccia team have investigated the possibility that manipulation of 20E signalling might affect the life history events of the anopheline mosquito, and thus contribute to the control of this malaria vector. To do this they used a synthetic 20E, the non-steroidal agonist methoxyfenozide. This compound is one of the dibenzoylhydrazines which mimic the effect of ecdysteroids. By binding competitively to the ecdysone receptor, these agonists cause high activity of ecdysteroid which has been shown to cause mosquito larvae to moult prematurely, leading to death. They applied methoxyfenozide to the thorax of female Anopheles gambiae after they had mated, but before they had been given a blood meal. Virgin females were also treated to see whether the synthetic agonist affect mating success or longevity. Egg laying by treated mosquitoes was significantly reduced in a dose-dependent manner and, if mosquitoes did lay eggs they laid far fewer than untreated females. Very little egg yolk had been deposited in the ovaries of almost all treated females and staining revealed that the ovarian follicle cells had died by apoptosis (a form of programmed cell death). When female mosquitoes mate, sperm is stored in a round storage organ, the spermatheca. By dissecting this and examining it for the presence of sperm the researchers deduced that insemination was significantly reduced in females treated with methoxyfenozide compared with untreated ones. In addition to causing a reduction in reproductive fitness, topical application of this ecdysteroid agonist reduced the lifespan of virgin females, even at the lowest dose. Finally, they tested the effect of this hormone treatment upon the capacity of the treated mosquitoes to be malaria vectors. Following application of one of three doses of methoxyfenozide they fed treated and untreated females on blood containing the human malaria parasite, Plasmodium falciparum. Just over half of the untreated mosquitoes became infected but the two higher doses of the 20E agonist significantly reduced the number of mosquitoes that became infected, with the higher dose reducing the number infected by 87%. This surprising result, combined with the effects that the 20E agonist had on this anopheline mosquito reproduction and lifespan in a laboratory setting, led the group to evaluate theoretically its potential as an agent to control malaria transmission. rest after feeding. They also factored in the possibility of some resistance developing in the population at both high and low coverage of bednets and spraying. One of the major determinants of mosquito population size is competition at the aquatic larval stages. The model showed that at high doses and high coverage with the steroid agonist, mosquito populations would be driven to extinction, whilst at lower coverage levels the population would actually rise because some reduction in egg laying would result in less competition for the larvae. However, because of the effect of the agonist on life span, the age structure of a population would change. The result would be an increase in younger females who would not have lived long enough for malaria to develop to become able to be transmitted to humans (at least 12 days). Thus there would be fewer mosquitoes able to transmit malaria. In the light of the rapid spread of insecticide resistance in mosquito populations it is particularly important to try to assess whether targeting steroid hormone signaling has the potential to become as useful as insecticides in reducing malaria transmission. By combining the effect of methoxyfenozide treatment on malaria infections with the shift in age structure of the treated mosquito population, the model was also used to make a comparison between the effectiveness of this hormone treatment with the use of an efficient insecticide. The highest dose of ecdysteroid agonist showed a reduction in the number of mosquitoes able to transmit malaria that was equivalent to a 100% effective insecticide. As a compound that is non-toxic to humans, methoxyfenozide shows great potential for use alone or in combination with insecticide on treated bednets. Validation of the findings of the model by field testing the compound is an essential next step in testing this potential. If as successful in the field as the model predicts, compounds that interfere with steroid signaling could well be added to our much needed arsenal of strategies to control malaria transmission.